Coconut is a multipurpose fruit with high economic value. Though mango is the king of fruits in India, coconut is celebrated as a symbol of prosperity, a blessing of nature, an auspicious object of ceremony, a useful item of handicraft, and an essential ingredient for cooking. The origin of this plant is debated. The mentions of coconut are found in the “One Thousand and One Nights” story of Sindbad the Sailor. He is said to have sold it during his voyage. Marco Polo called this tropical fruit Nux Indica in 1280. The names used by the Arabs to refer to it mean “Indian nut”. The crew of Vosco da Gama’s ship named it Coco after a ghost in some Portuguese folklore as the rough surface of coconut reminded them of the ghost. Today is the World Coconut Day. We at Indian Eagle are glad to share some offbeat facts of coconut and how this coastal fruit crept into the socio-cultural fabric of India. Coconut is a beauty of Kerala. 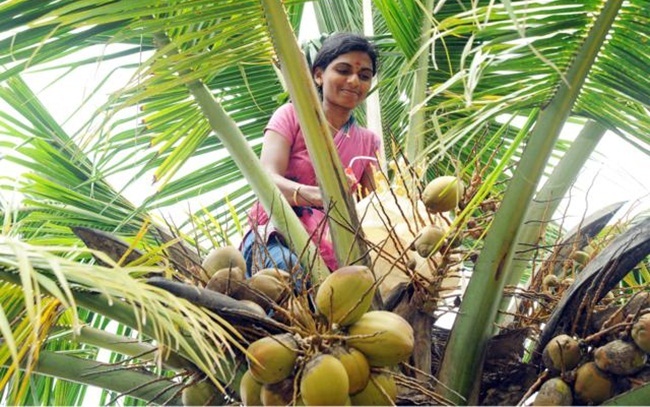 Unique to the rural landscape and cultural life of Kerala, coconut plays an important role in the economy of the state. Coconut farming is a great means of sustenance for a majority of rural population across the backwaters of Kerala. Evidently, with about 46% of the total production, Kerala is the largest coconut-producing state of India. Kerala literally means “Land of Coconut Trees”; so the state owes its name to this hard-shelled fruit. Kerala is combined of two words: “Kera” meaning coconut tree and “Alam” meaning land. 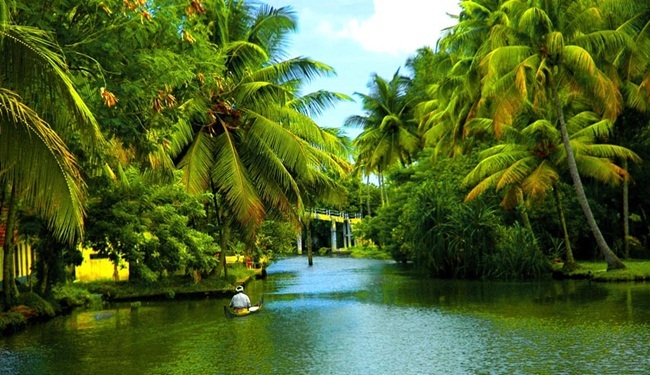 The shores of backwaters are dotted by rows of coconut trees across the landscape of Kerala. Coconut palms of different heights with their roots deep in the soil and hanging over the waters add to the green beauty of the state. Climbing on to the peak of coconut trees by dhoti-clad rural men with a piece of cloth wrapped around the forehead is a common sight to behold during Kerala travel. Kerala Tourism conducts tours to fields of coconut plantation in Kochi, Paravur, Periyar, Kumarakom, Mararikulam and Thiruvananthapuram. Coconut is an essential ingredient in many dishes from the cuisine of Kerala. For instance, Aviyal, one of the traditional Kerala delicacies, is a dish of mixed vegetables with lots of coconut gratings. Even paste of coconut gratings is used in many south Indian curries. 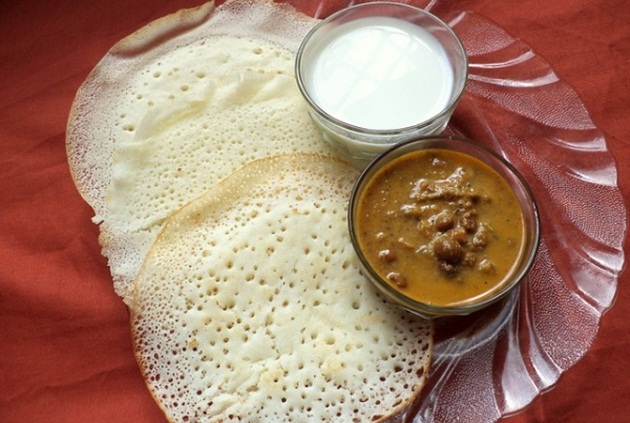 Coconut Chutney is a principal accompaniment of south Indian snacks such as Dosa, Idli, Wada, and Mysore Bajji in Andhra Pradesh, Telangana, Karnataka, Tamil Nadu and Kerala. Green coconut water works as a hydrating fluid for the body. Coconut milk is used in making different sweetmeats. Coconut water is a refreshing drink available on the beaches of India in all seasons. Sipping coconut water while taking sunbath or lying back on sands is part of a beach holiday in India. Coconut has a special place in the Hindu culture of India. It is believed to be an auspicious fruit and used in many rituals on pious occasion. 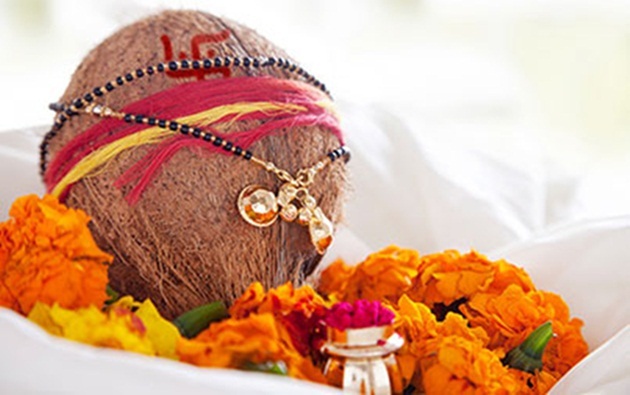 Coconut is offered to deities in Hindu temples across the globe. Many holy events and celebrations are inaugurated with breaking of coconuts. Both flesh and water of coconut are among the essentials for worshipping ceremonies. Earthen or copper or brass pots with green coconuts and mango leaves are put on both sides of main entrance of temples, households and workplaces on festive days. It is a symbol of prosperity and believed to welcome Lakshmi, the goddess of wealth for Hindus. In the coastal regions of India, fishermen offer coconut to seas, expecting to catch fish in abundance. Devotees break as many as 108 coconuts at a time, at some temples of Lord Ganesh and Lord Hanuman. Coconut plays an important role in Buddhist weddings. Coconut flowers are present along with other things during marriage ceremonies in Kerala. Gas warfare was initiated during the First World War. Use of gas masks became a must for survival in gas warfare. Carbon is used in gas masks to filter the air for safe breathing. Only high-quality carbon makes it possible. Carbon obtained from burning of coconut husks is used in gas mark production to filter out toxic substances in the air. More, coconut carbon is used as a cleaning material at Fukushima nuclear plant in Japan. What is the most surprising fact to share on the occasion of World Coconut Day is the Coconut Palace in Manila. The Coconut Palace is named so because 70% of the sprawling structure is made of coconut lumber. Different components of coconut trees have been used in the interior décor and furnishing of the building. Ferdinand Marcos, former President of the Philippines commissioned construction of the Coconut Palace to impress Pope John Paul II during his visit to Manila. Goa and Kerala have seen evolution of coconut craft in India. Gifted artists create beautiful objects out of coconut shells in both intricate and crude forms for interior décor. 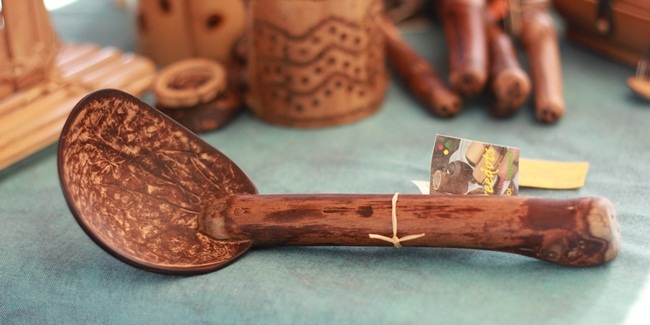 Handcrafted artworks from coconut shells are imperishable and exude raw elegance. Dry shells are carved in different designs and shapes to make utility and decorative items such as pen holders, wall hangings, bowls, spoons, ice cream cups, flower vase, etc. 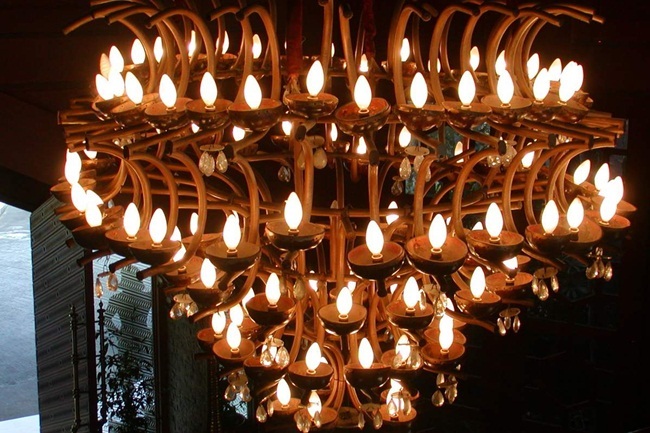 The Chandelier at Coconut Palace in Manila, the Philippines, is one of the finest items of coconut shell handicraft. Indian Eagle shares interesting stories of India to inspire you for India travel and books cheap airline tickets to India from USA. Get the best flight at Indian Eagle! Very informative. I wonder why the opposite specialists of this sector do not realize this. You must continue your writing. I’m sure, you have a great readers base already! I am new to this, I stumbled upon this I have found it absolutely useful.Thanks for the info. Nice to see you stop by Travel Beats and appreciate our effort! Thank you very much! Awesome site you have here but I was curious if you knew of any community forums that cover the same topics talked about here? I’d really like to be a part of community where I can get suggestions from other knowledgeable people that share the same interest. If you have any suggestions, please let me know. I use coconut cream in my curries but I didn’t know that the shell was imperishable and will start to use them in more of my crafts. I am dedicated to crafts and that they are a big part of my medicative life. I would like more ideas how to use the shells . Where could we get more info of Coconut I’m doing a research on Coconut and it’s cultural impact in India?